In a small bowl, combine oils, vinegar, salt & pepper, and sugar. Stir until the sugar dissolves. Pour over the rice in a larger bowl. Toss gently to coat, then set aside. Steam the carrot & peas for one minute. Drain & stir into rice. Add remaining ingredients and stir to combine. Let cool. This recipe was originally written to be served cold. However, for the sake of time in our house (we were pretty hungry! ), I served it warm. The vinaigrette that you mix in with the rice adds a really nice, subtle flavor to the rice, without overpowering whatever you are serving the salad with. You can even add a touch of soy sauce if you wish. The original recipe also calls for a few more vegetables. I omitted those simply because we were making shish kabob and grilling vegetables anyways. 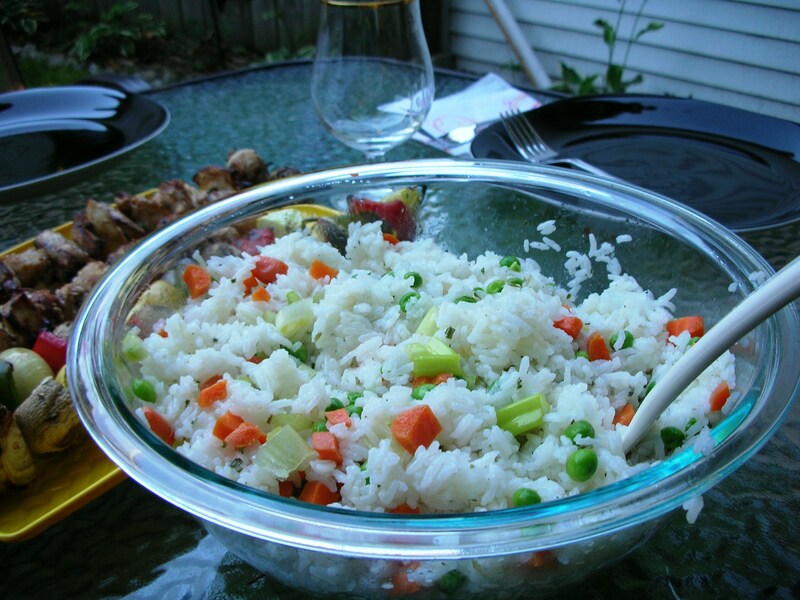 When making this again, I would add sweet peppers, maybe some bok choy, or bean sprouts. The possibilities are endless! With more vegetables and some protein, this could also be a really easy, filling main dish. We do have a significant amount of leftovers, so this will most likely get made into fried rice for lunches.